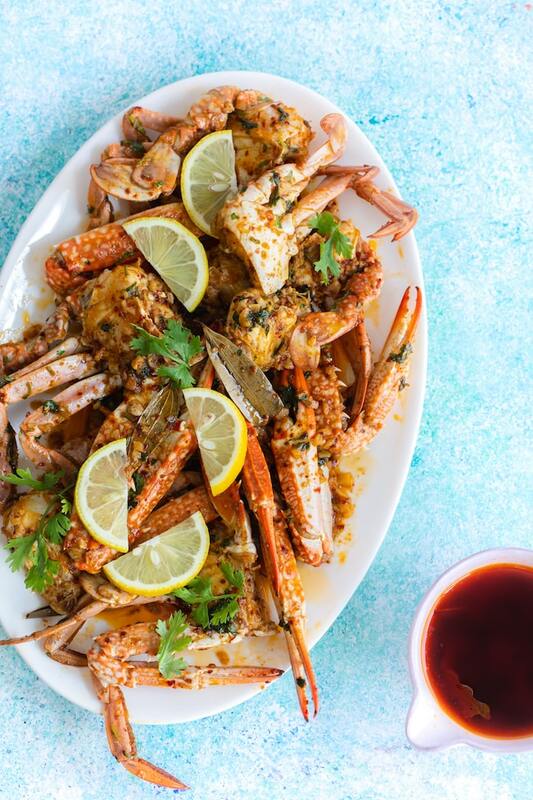 This recipe for Crab with Spicy Garlic butter sauce is to die for. Its buttery, garlicky, full of flavor and the best part is you can get in ready in 40 minutes or less. How I got hooked on to seafood. If you ever visit Goa, you should definitely try the seafood there. It was there where I got hooked on to seafood. The appetizers coated with a crisp layer of semolina, the flavor of coconut milk, curries made by grinding fresh coconut and spices is bound to take any foodie to paradise. Until then, the only thing I ate out of the sea was fish:). Don’t you have a mental block when it comes to cooking specific food? Crab, Squid, and Lobster was something I thought I would never try. Nevertheless, it was only because my older one insisted that I even tried making it and I must say I have discovered some delicious recipes on my way, like the Fried Calamari or Spicy Squid. 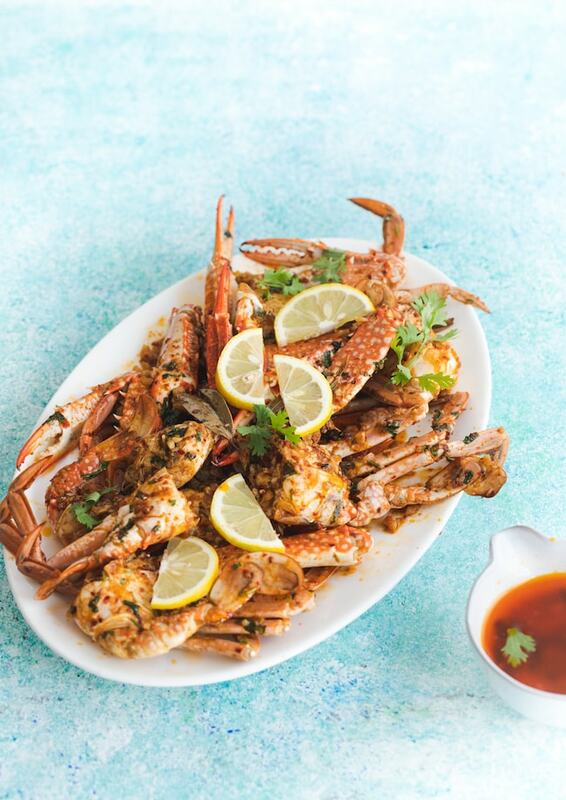 This Crab with spicy garlic butter sauce is irresistible in every way. In fact, Nivaan thinks I should make it every day. In general, anything with butter tasted good, Right? But when you add garlic to butter, it’s heavenly, and the spices will tickle your taste buds. Moreover, the crab meat becomes tender when simmered in butter sauce, and the flavor of herbs and spices gets absorbed. How to buy fresh seafood. A dock or a fish market is the best place to buy seafood. Always enquire when the fresh catch arrives. Generally it in the morning or sometime in the early afternoon and don’t buy stuff that has been sitting on ice for too long. On the contrary, if you don’t have access to a dock, then buy it from one of the good supermarkets in your area. Keep an eye on their hygiene practices and how they handle seafood. The problem is seafood tends to dull and rot quickly compared to other meat. Fresh seafood should not have a strong unpleasant smell. When selecting fish, the eyes should be clear and not cloudy, and the gills should be dark red. If buying frozen then check the labels to see where its from and how it was packed. If you ever want to get the gamey smell off, you can wash it in a little bit of vinegar or lemon juice. Lemon and vinegar can be your best friend when it comes to getting rid of the smell and the fishy taste. Tang in a seafood prep is directly proportional to the fantastic flavor. The recipes which I make often is the Kerala style red fish curry. It’s by far one of best fish curry there is in my opinion. It’s tangy, spicy and I have had friends who never touched seafood in their life swear by it. 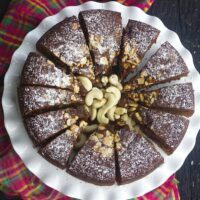 The other recipe I use is the one with coconut milk. This Salmon curry with coconut milk is one of the easiest things you can make. It’s a one-pot curry where you add everything and just simmer the gravy. This seafood boil sauce is also great for crawfish and Shrimp. This recipe for Crab with Spicy Garlic sauce is to die for. Its buttery, garlicky and full of flavor. The best part is you can get in ready in 40 minutes or less. Wash the cleaned crab a couple of times in cold water and keep it aside. Once the water boils, add the washed crab and cook till it turns pink. Melt butter in a heavy bottomed pot large enough to hold all the crabs. Turn the heat to medium-low until the butter melts and take care so that the butter doesn't burn. Add the bay leaves and the garlic and cook till you can smell the aroma of garlic. Now add the spices and stir for a minute to get rid of the raw flavor of spices. Add the vinegar, pepper, salt, cooked crabs, coriander leaves and saute for a minute. Cover and cook for another 15 minutes, stirring it every five minutes and coating all the crabs with butter. 10. Taste and adjust the salt as needed. Be careful when doing so as the butter will be very hot. 11. Transfer the crabs onto a serving plate. Serve with fresh cut limes and sauce in a bowl. To save time while cooking, you can boil the crab and start making the sauce simultaneously. Add the level of spice as per your taste. This seafood boil sauce recipe can be used for other seafood too. Have you been searching for an excellent tutorial to get bright and airy images? Look what I found. Joanie’s youtube channel The Bite Shot is a powerhouse for information on food photography. Follow her on Instagram if you want some behind the scene insights.